Will Michelle's Second Inaugural Gown Be Better? Though the second inauguration of Barack Obama is unlikely to recapture the excitement of his first — 1.8 million attended four years ago, but half as many are expected this time — one aspect of the inaugural festivities may be more hotly anticipated this time around. For all the fascination surrounding 2008’s bridal-inspired Jason Wu gown, the next four years saw Michelle Obama’s transformation from image-challenged campaign spouse to international style icon. 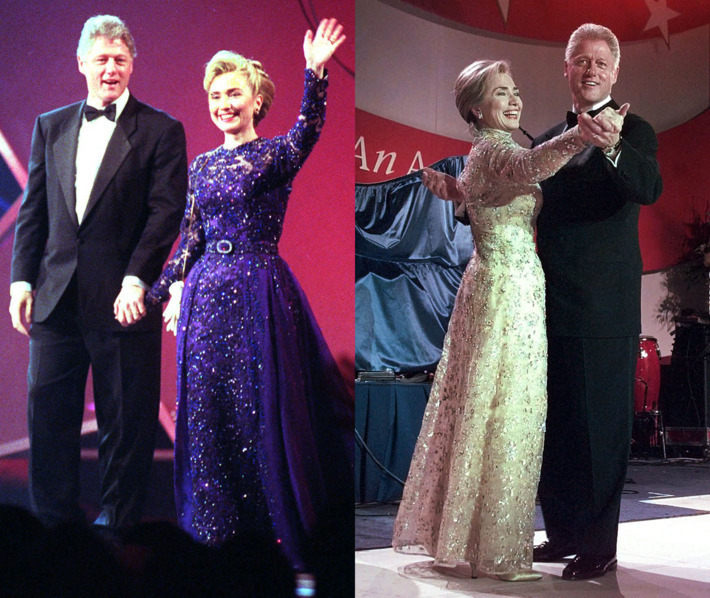 And if the second inaugural ball gowns of her predecessors are any indication, that could result in a riskier look on Monday. While four years in the White House seem to make presidents age twice as fast, the maturation of First Ladies’ style tends to be positive — in the eyes of the press, at least. Likewise, with a Vogue cover under her (Alaïa) belt, favorability ratings higher than her husband’s, and her years as a source of suspicion for voters long behind her, Mrs. Obama would be well poised to make a more personal statement this time around. Mikki Taylor, author of Commander in Chic: Every Woman’s Guide to Managing Her Style Like a First Lady believes her style has already changed: “Mrs. Obama’s style has definitely evolved over the last four years. While she still works her ‘classic with a twist’ style ever so well, she’s more fearless in that she mixes patterns, texture, color and eye-catching accessories at every turn now,” she explains. 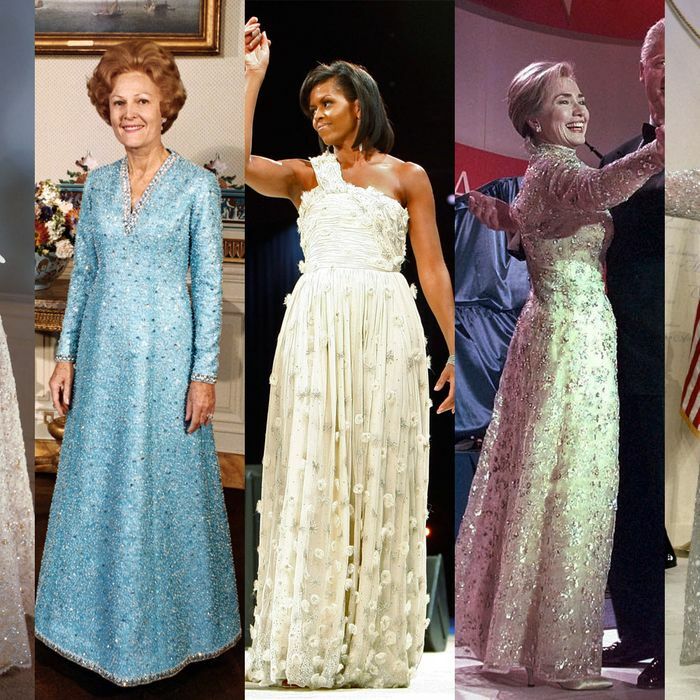 But because only first inaugural gowns traditionally appear in the Smithsonian’s First Ladies’ Modern Gown Gallery, second gowns rarely inspire the remembrance of the first — even though a number of second gowns have been more fashion-forward and universally praised. For MObama watchers, speculating about what she will wear for her second inauguration has joined the ranks of “Who Shot J.R.?” in pop culture mysteries. In a recent study of the first lady’s style evolution, the New York Times’ Cathy Horyn points out that, unlike previous First Ladies, Obama has resisted hitching her wagon to one favored designer, wearing as many as 50 different labels in a single year. Deducing who will win this year’s fashion designer equivalent of a lottery ticket is, consequently, nearly impossible — not that onlookers and fashion insiders aren’t trying. The New York Times profile also calculates that Obama’s appearance in a label is worth nearly $14 million dollars to a brand. Will that confidence manifest itself on inauguration night? “I don’t know why, but I feel like she will make a statement in this way at the inaugural this time around,” Betts continues, offering perhaps the most surprising theory of all: “For the inaugural we may see her repeat a gown she’s worn before.” Obama did, after all, repeat a Michael Kors dress on election night. But a style icon repeating a gown on the most heavily photographed night of her year? Now that really would require confidence. Keli Goff is the author of The GQ Candidate and a political correspondent for The Root. The first (but certainly not last) First Lady to face criticism for her shopping habits, Mrs. Lincoln is believed to have spent $2000 (a small fortune in 1861) on her first inaugural ball gown and to have stayed later at the party than her husband did. There remains some dispute regarding which dress she wore when, however. Though a white gown with a floral garland (at right) generally gets the credit as her 1861 ball gown, some Lincoln collectors believe a gown dotted with floral bouquets (at left) was the first. Her 1865 gown was likely a purple velvet ensemble designed by former slave Elizabeth Keckley. The Washington Post offers a photograph of a replica of that gown here, while the Smithsonian keeps a similar Keckley-designed gown in their collection. Keckley eventually wrote a memoir; actress Gloria Reuben portrays her in Lincoln. Because her husband won reelection four times, Americans witnessed Eleanor Roosevelt’s style evolution over a span of more than twelve years, as the country’s tastes changed, too. 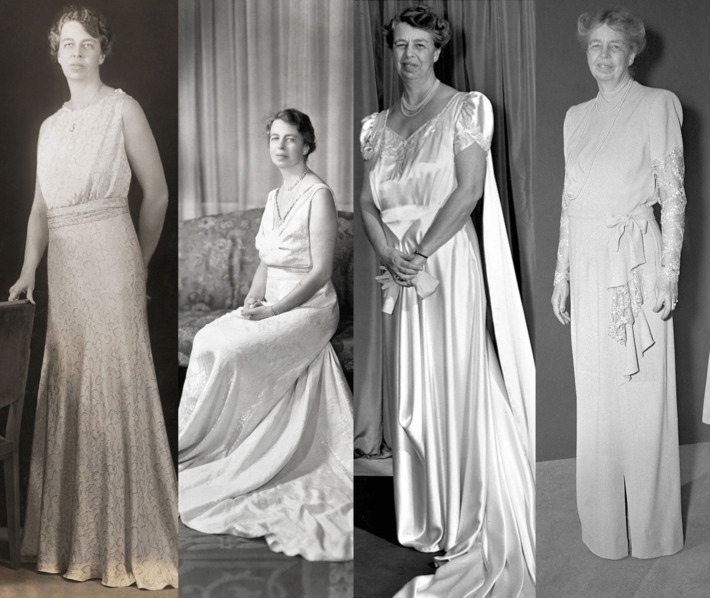 Her first two gowns, worn in 1933 and 1937, proved that Roosevelt, like a certain moden first lady, was not afraid to show her arms. 1941 saw cap sleeves, and as World War II dominated her husband’s presidency, Eleanor arrived at her most conservative look in 1945. 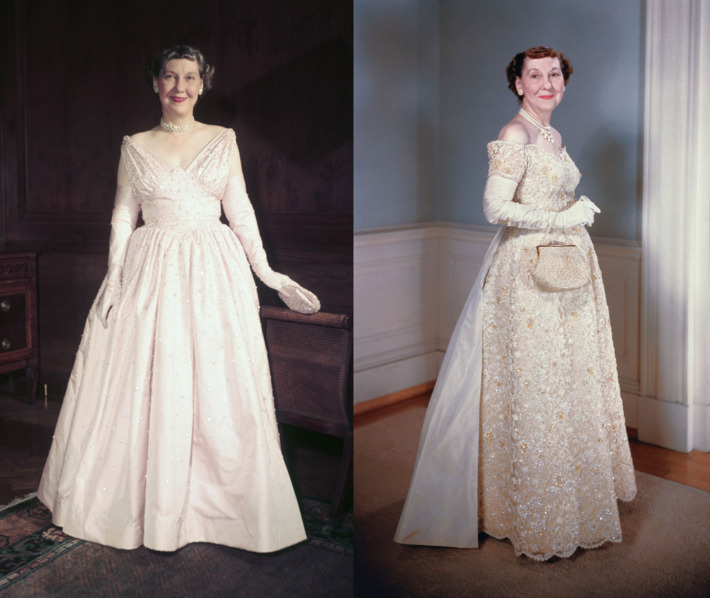 The excitement over First Lady Mamie Eisenhower’s first inaugural gown — a pink silk dress worn in 1953 and featuring 2,000 rhinestones — was so great that the Smithsonian altered its inaugural gown tradition. Until then, First Ladies donated their gowns after their husbands left office; Eisenhower’s was the first to display during her husband’s term. Though long credited to designer Nettie Rosenstein, the pink gown is now believed to be the work of Rosenstein’s daughter-in-law Eva Rosencrans, who may have been responsible for much of her MIL’s oeuvre. The yellow lace dress Eisenhower wore to her second inaugural ball in 1957 was also a Rosenstein — or Rosencrans — creation. Richard Nixon’s second-best remembered speech — after his resignation speech — is one in which he described how frugally his family lived. 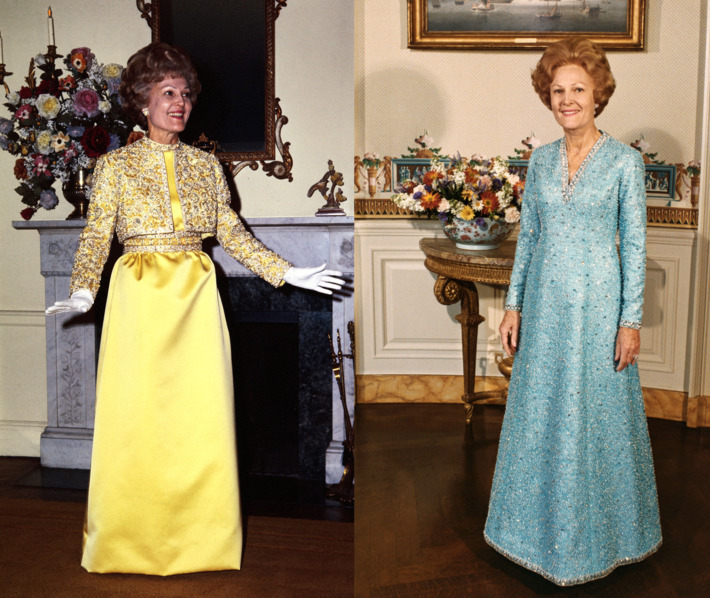 So it’s no surprise that First Lady Pat Nixon never really embraced the fashion world. For her husband’s 1969 inauguration, Nixon opted for a yellow satin gown with matching crystal-adorned jacket designed by Karen Stark for the Harvey Berin label. Four years later, she donned a more sleekly modern look. A former actress, Nancy Reagan is credited with bringing Hollywood glamour to Washington, beginning with her inaugural wardrobe. 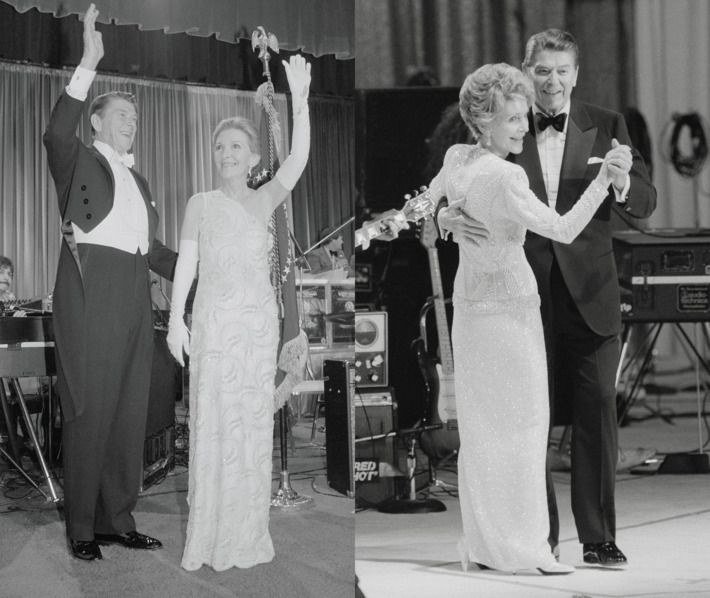 For her husband’s first ball in 1981, Reagan turned to legendary dressmaker and costume designer James Galanos for an intricately beaded, one-shouldered white gown. (The $22,500 pricetag solidified her reputation as “Queen Nancy.”) Four years later she wore another Galanos gown, but this time with two sleeves, both full-length — a little less red carpet, a little more Beltway. For her move from the Arkansas Governor’s Mansion to the White House, Hillary Rodham Clinton turned to relatively unknown designer Sarah Phillips for her 1993 inaugural gown. Phillips described the deep purple dress as “a fairy-tale sort of dress.” But the reviews were mixed; Phillips struggled to capitalize on the publicity and eventually went out of business. Clinton, meanwhile, struggled to find her fashion footing, commanding endless obsession (and occasional ridicule) with an ever-changing array of hairstyles, headbands, and power suits. But in 1997, her second inaugural gown, a pale gold Oscar de la Renta confection, won applause from the fashion world. De la Renta, now a “friend,” also designed Clinton’s mother-of-the-bride dress for daughter Chelsea’s wedding. 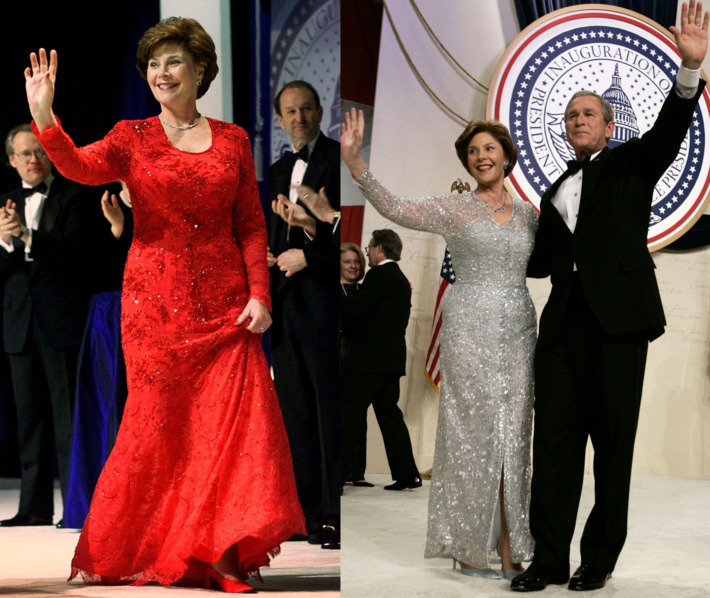 For her first inaugural ball as First Lady (not to be confused with those she attended a first daughter-in-law) Laura Bush wore a red lace dress with crystal beading by Michael Faircloth, a custom dressmaker from her home state of Texas. It failed to impress, criticized as “more festive” than necessary and out of step with Laura’s personality. Four years later, Bush unveiled a trimmer figure and a more sophisticated look that set fashion writers aflutter. The designer of her 2005 look? Oscar de la Renta, patron saint of White House style and First Ladies’ second chances. 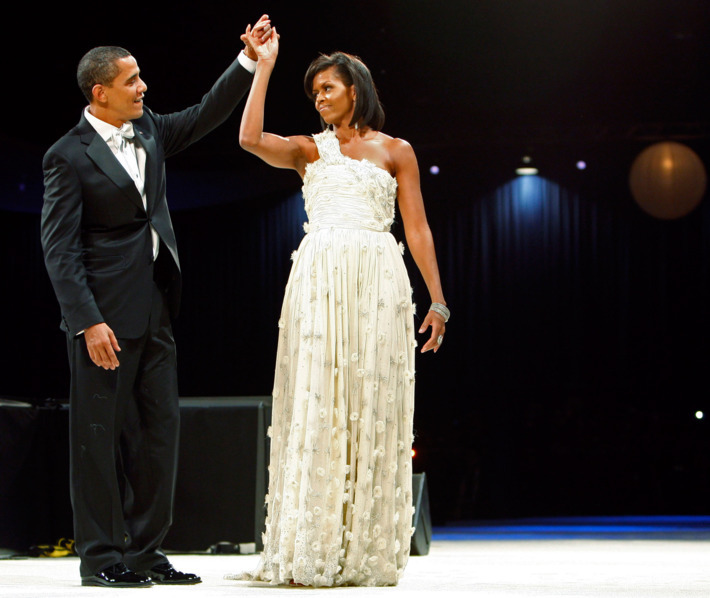 Her first inaugural gown, designed by then little-known designer Jason Wu, pushed the designer to the mainstream and the First Lady toward her future style icon status. Though speculation about MObama’s second gown is at a fever pitch (due in part to the frequency with which her picks become bestsellers) her resistance to choosing any one designer as her hands-down favorite makes the guessing game a difficult one.